The idea that became Habitat for Humanity first grew from a community farm outside of Americus, Georgia, founded by farmer and biblical scholar Clarence Jordan. On the farm, Jordan and Habitat’s eventual founders Millard and Linda Fuller developed the concept of “partnership housing.” The concept centered on those in need of adequate shelter working side by side with volunteers to build decent, affordable houses. The houses would be built at no profit. New homeowners’ house payments would be combined with no-interest loans provided by supporters and money earned by fundraising to create “The Fund for Humanity,” which would then be used to build more homes. Today, Habitat for Humanity is a global nonprofit housing organization working in nearly 1,400 communities across the United States and in approximately 70 countries around the world. Habitat’s vision is of a world where everyone has a decent place to live. Habitat works toward our vision by building strength, stability and self-reliance in partnership with people and families in need of a decent and affordable home. HFHI was founded in 1976 by Millard and Linda Fuller. Supports international collaborations and partnerships that allow Habitat to build in 70 countries worldwide, and 1,500 US communities. To learn more about HFHI’s history and work, please visit their website. Habitat for Humanity Texas was established in 2005. As a state service organization, Habitat Texas is guided by four pillars of service determined by HFHI. These four pillars of service guide Habitat Texas in its efforts to work with and assist Texas’ affiliates. The four pillars of service are: Advocacy, Training & Technical Assistance, Resource Development, and Disaster Services. 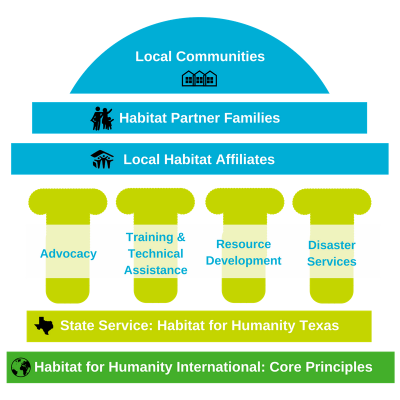 Whether it’s through resource development, advocacy, or training & technical assistance, Habitat Texas aims to increase the build capacity of Texas Habitat affiliates. Click here to learn more about how Habitat Texas works to increase build capacity of Texas affiliates. Texas’ Habitat affiliates range in size and build capacity. Overall, Texas Habitat affiliates coordinate many volunteers annually, and represent over 14,000 Habitat homeowners. Whether an affiliate is large or small, Texas Habitat affiliates work to support local communities in big ways. $2.1 million in new tax revenue for local governments is accrued. Click here to find your local affiliate to become involved in volunteer opportunities and local programs and see services offered. ReStores are stores that are owned and operated by Habitat affiliates that salvage new and gently used household items and building materials. Once an item or material is salvaged, it is then resold to the public for 50-80% of the item or materials retail price. Click here to find your local ReStore to donate an item or to shop and support a local Habitat near you. Habitat Campus Chapters are a great way for students to get involved in Habitat’s mission. A campus chapter is a group of students who are passionate about helping people build better lives for themselves, and are ready to take the next step to lead the charge at their school to help fulfill Habitat’s mission. Student chapters are self-led and engage in fundraising and awareness raising events on campus, and help build community partners among their peers. Click here to see if a Habitat Campus Chapter is currently active on your campus.